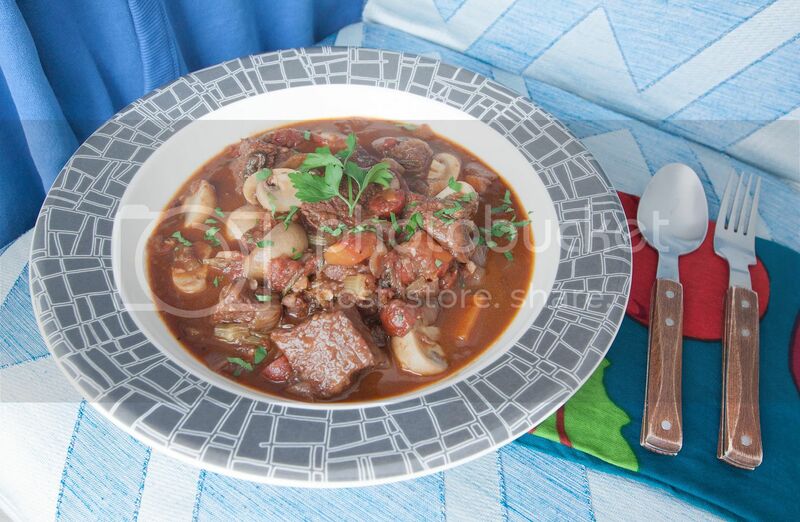 This dish was served on New Year's Eve, something fancy yet comforting at the same time. The best part is that braised beef can be made one day ahead, which means one less thing to worry about when having guest/s over. One more bonus, the beef tastes even better after resting in the fridge overnight! My local butcher was having a great discount for prime ribs. I know it might be a waste using quality cut in braised dish, but hey, I got a good deal. 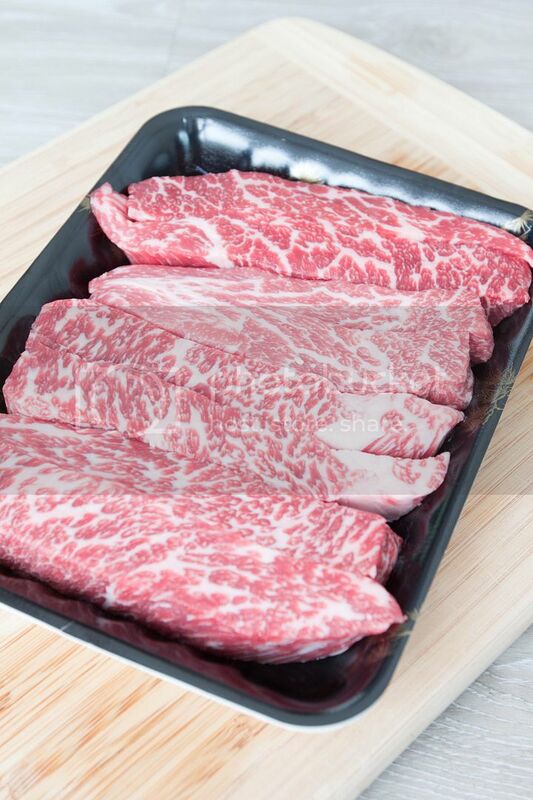 On top of that, using such marbled part of the beef can significantly reduce cooking time. Usually it takes up to 4 to 6 hours to break down tougher part of the beef, but for prime rib, two hours does the trick. Peel and dice the onions. Peel and dice the carrot. Dice the celery. Peel and chop the garlic cloves. Trim off the stems and dice the tomatoes. Clean and halve the button mushrooms. Cut the chorizo into smaller pieces. Cut the beef into large bite size pieces. Drizzle some oil to a big pot, just enough to evenly coat the bottom. 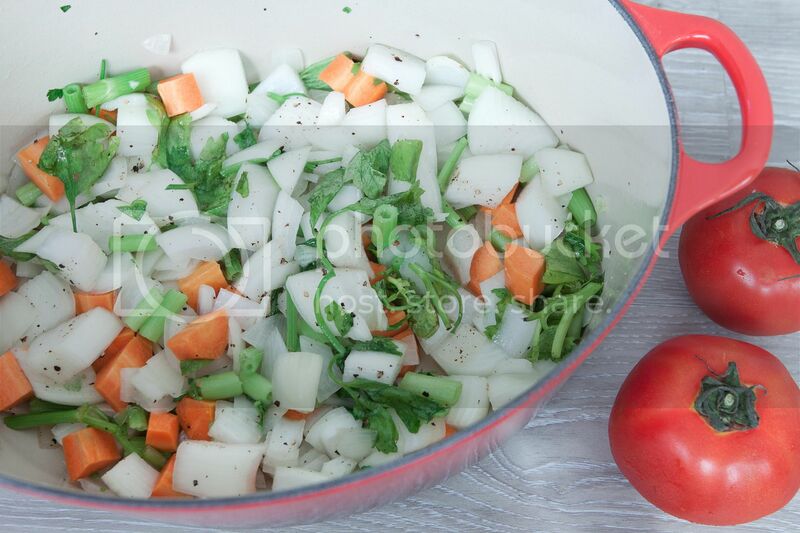 Turn to medium high heat then add in the onion, carrot, celery, along with salt and pepper. Give it a quick mix and cook till the onion starts to brown on the edges, takes about 5 minutes. Add in garlic and chorizo, cook for another minute or two. 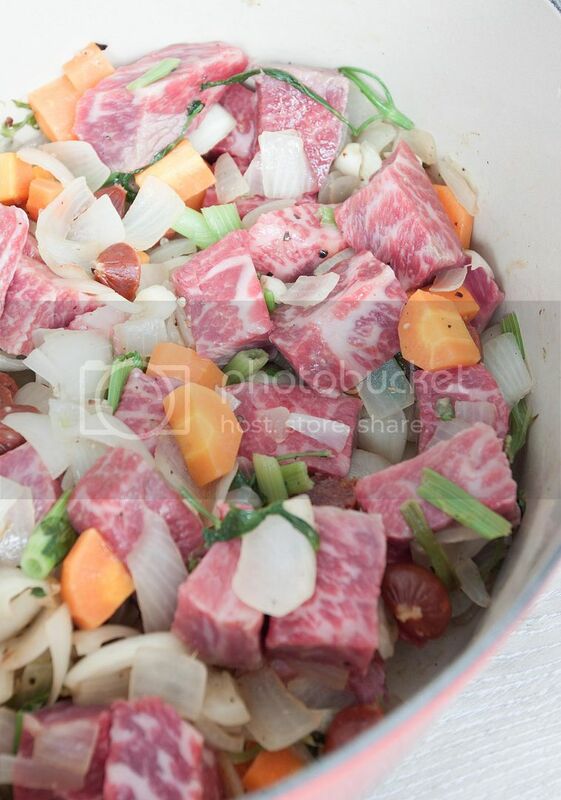 Transfer the beef into the pot and give it a light sear. 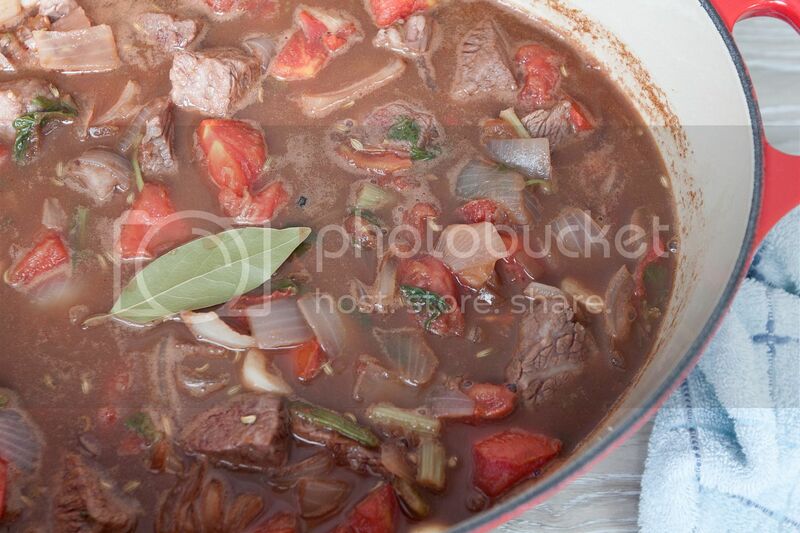 Pour in the stock, onion soup, tomatoes, tomato paste, red wine, fennel seeds, sage powder, and top with one bay leaf. Bring to a full boil then lower the heat to keep it as a light boil. Cover with lid and cook for 1.5 hours. Stir once a while, also make sure nothing is sticking to the bottom. The juice will reduce by at least 1/3, signaling the dish is almost ready to serve. Add the button mushrooms when the braised beef is about ready, otherwise the mushrooms will shrink when cooked too long. Cook for 10 minutes or less under low heat. Remove bay leaf before serving. 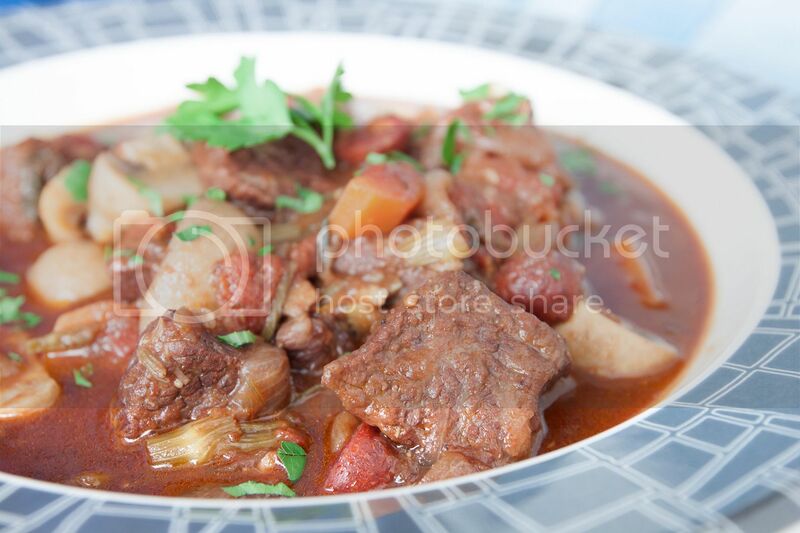 Transfer the stew to a serving dish and sprinkle some chopped parsley. The day after, I cooked some fettuccine and mixed with leftover beef stew. The main protein dish turned into a hearty pasta meal. Tabasco also helped in changing the flavors with a fiery kick. Frankly speaking, I can eat this for one whole week. It was a great way to start the new year.